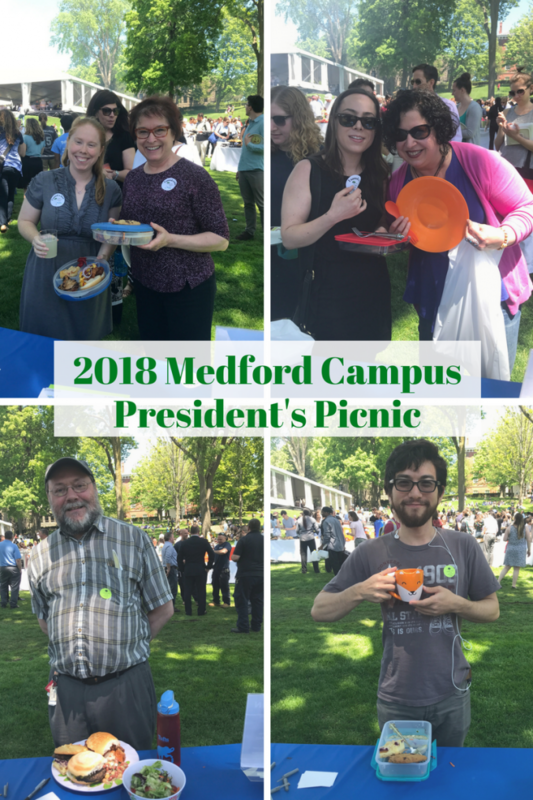 Another president’s picnic, this time on the Boston campus! Although it was forecast to rain, we luckily didn’t feel a single drop throughout the duration of the event. 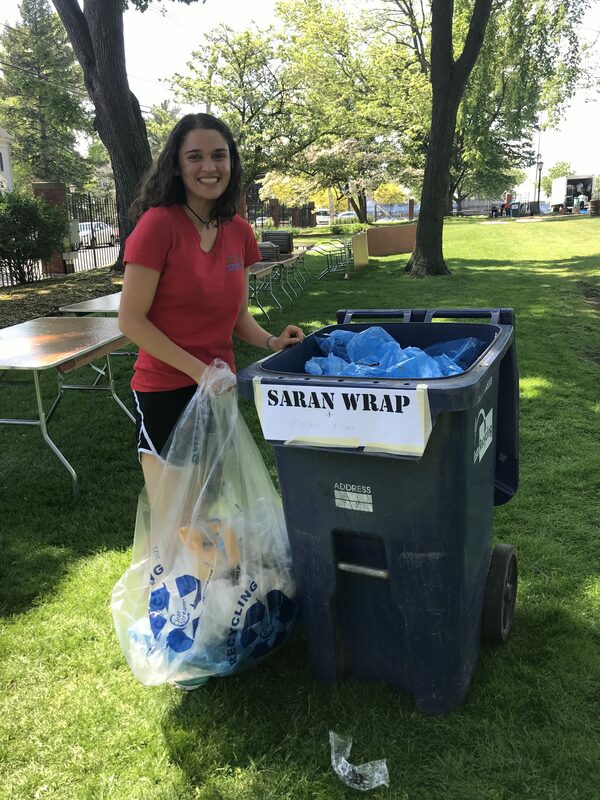 As with all of our zero waste events, all of the trash bins normally available in the green space next to the Jaharis Building for Biomedical and Nutrition Sciences on the Boston campus were covered so that attendees would not be able to use them. 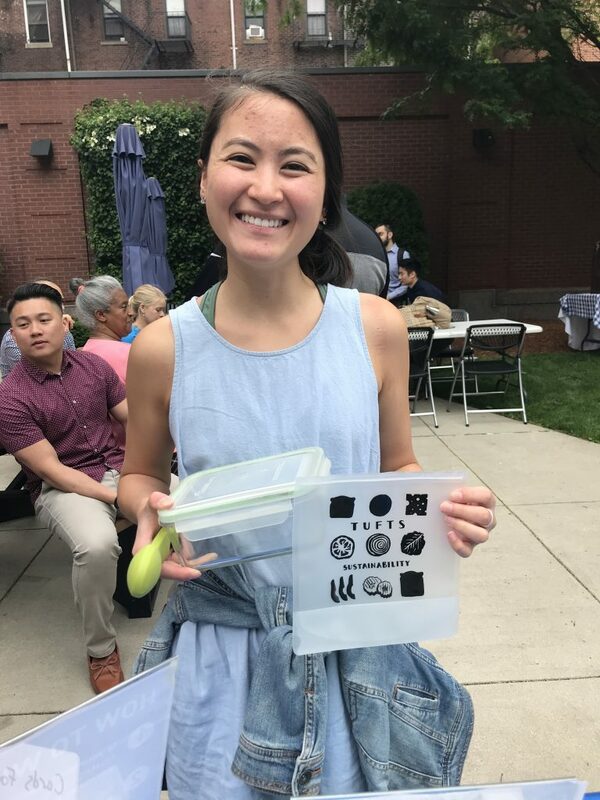 Something that was different about this particular zero waste event was that everything given to the attendees including cups, plates, utensils, and napkins were all completely compostable. 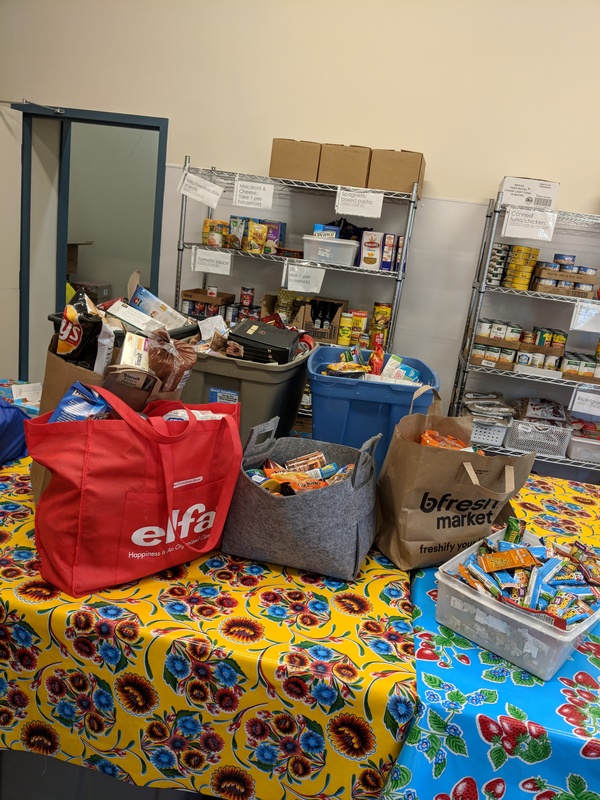 While we usually have both recycling and composting toters at our zero waste events, at this event we simply needed to direct people to place all their used items and leftover food into the compost. Michelle with the free reusable sandwich bag she got for bringing her own place setting! 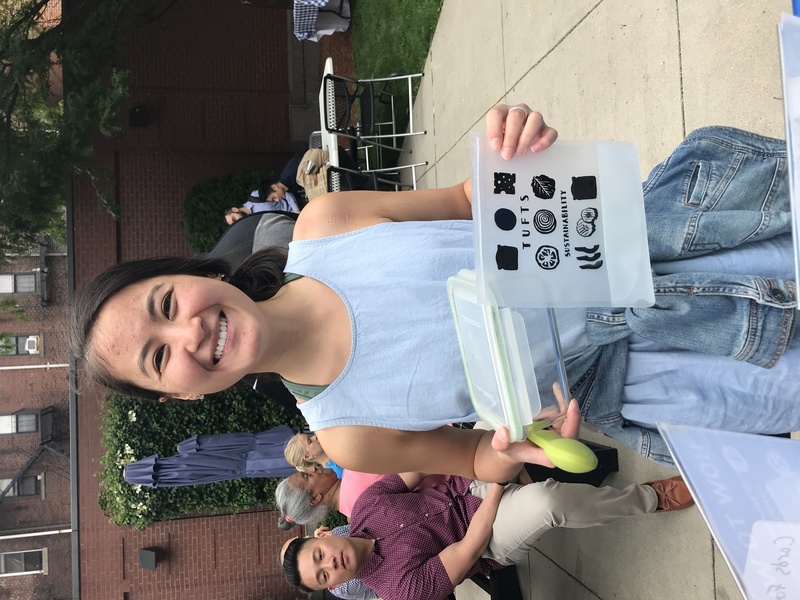 As has become tradition, we handed out free sandwich bags to the lucky first 50 people who came to the Office of Sustainability’s table with their own reusable place settings from home (or from their office!). 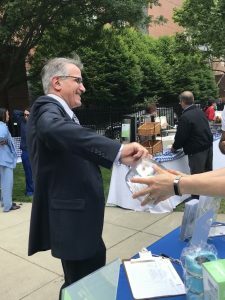 President Monaco picking the raffle winner! 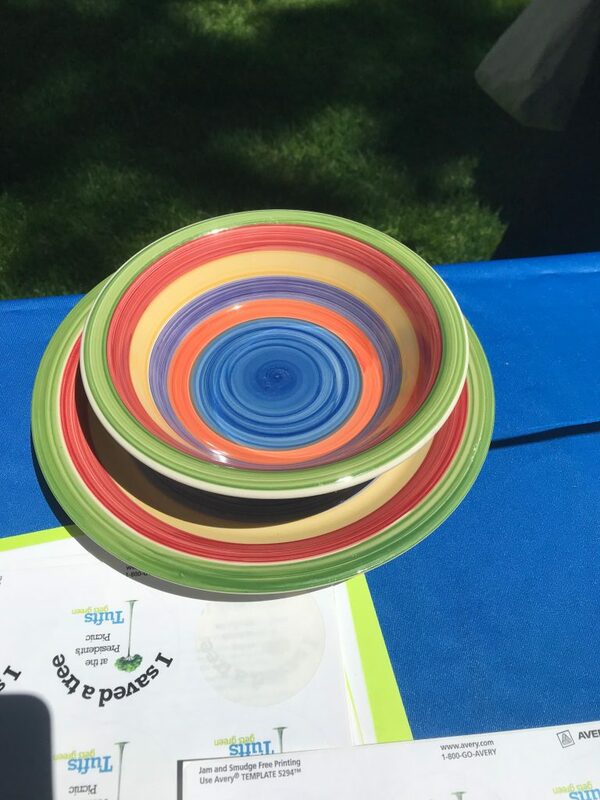 Additionally, everyone who brought a component of a reusable place setting was invited to enter our raffle. 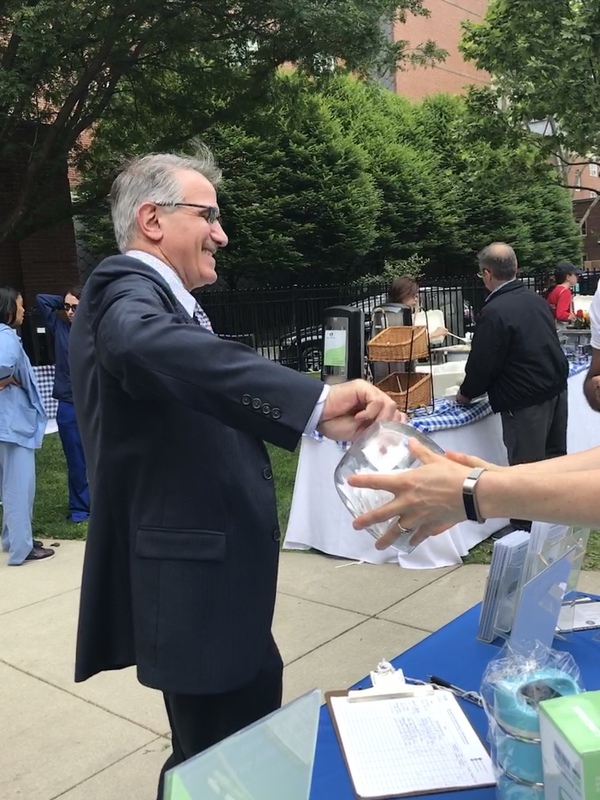 President Monaco picked the lucky winner, Dorothy Vannah, the director of the Simulation Learning Center at Tufts School of Dental Medicine. 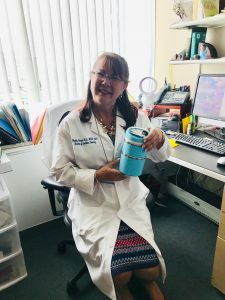 The lucky winner with her new lunchbox! In addition to handing out flyers about commuting benefits and becoming an Eco-Ambassador, we also had Michelle Lee-Bravatti, a second-year graduate student at the Friedman School help spread the word about the new composting program at the Boston campus that she initiated this past spring. Not only are there composting bins in several locations throughout the Boston campus, individual offices can also inquire about getting an office composting bin. Be sure to contact michelle.lee_bravatti@tufts.edu for more information. Next week, we’ll be in Grafton for the final President’s Picnic of the year! 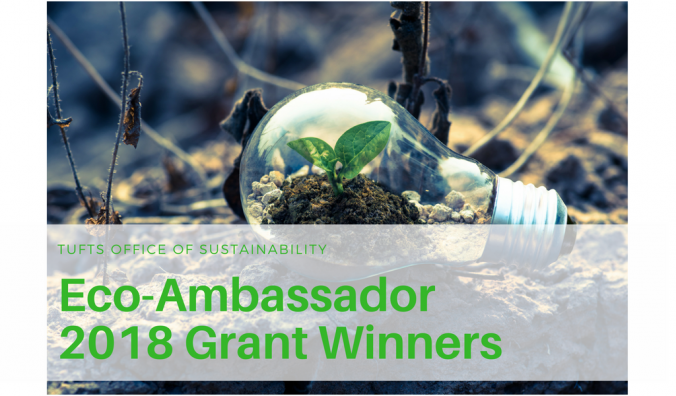 Through participation in either two condensed half-day or monthly 2-hour educational sessions, Tufts’ faculty and staff Eco-Ambassadors are eligible to apply for a $100 grant to help realize a project that will further sustainability efforts on campus. 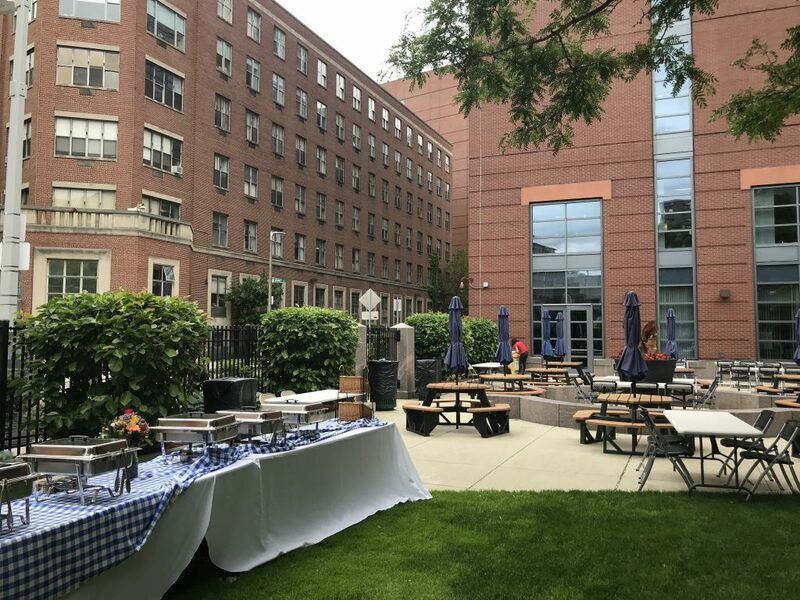 This year, there were 3 grant recipients: Chris Bishal from the Office of Student Affairs at Tufts School of Medicine, Misha D’Andrea and Brianna Florio from the Office of Admissions at SMFA, and Dan Birdsall from the Office of Admissions and Financial Aid at the Fletcher School. Read on to find out what the grants were used for this year! Chris Bishal from the Tufts School of Medicine at the Boston campus proposed to purchase reusable small plates, bowls, cups, and silverware for the Office of Student Affairs conference room. These are now used for meetings and gatherings as well as for every day use by staff. 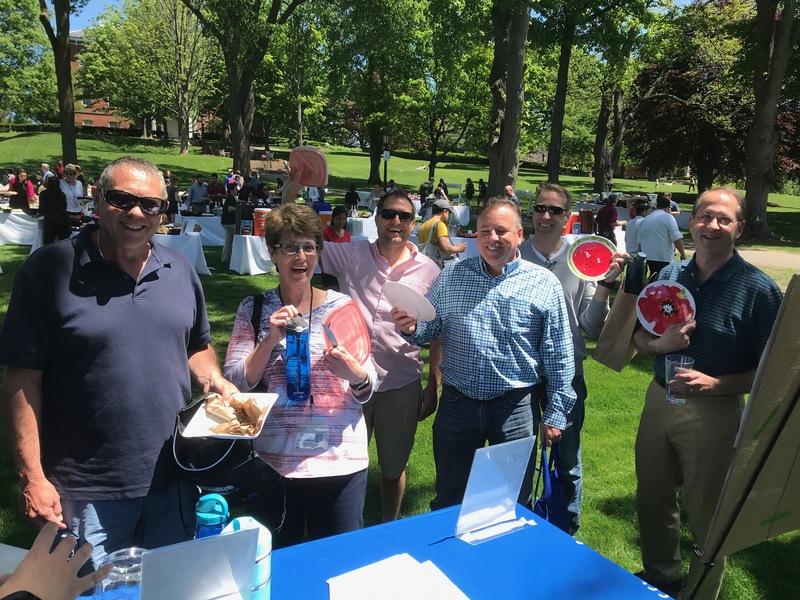 Previously in this space, light snacks, pastries, and coffee provided for various staff, Dean, and committee meetings as well as meetings between faculty advisors and student advisees were served on paper plates and consumed with plastic utensils. The new dishes purchased with the grant greatly reduce the amount of waste produced by these meetings. 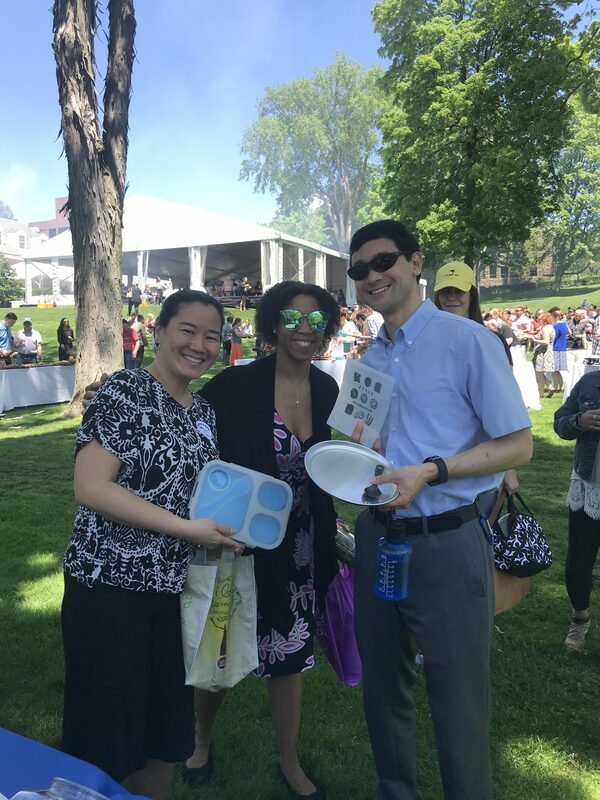 In order to make this year’s Jumbo day “as green as possible”, Misha and Brianna used the grant to purchase compostable plates, cups, utensils, and stirring sticks. 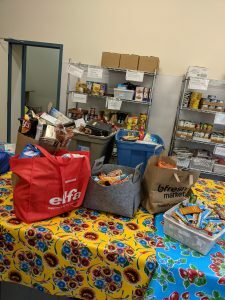 As these items are more costly than paper and plastic items, it would have been difficult to budget for them without the grant. 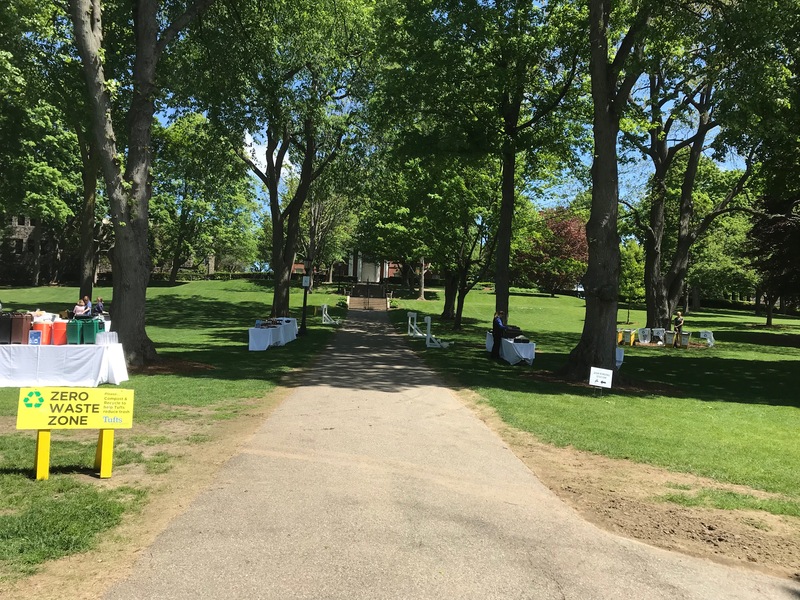 By having attendees compost all their food waste in addition to their place settings, they were able to make the event zero-waste. SMFA Eco Rep Maria tabling at Jumbo Day and getting future Jumbos excited about sustainability! Not only did Misha and Brianna help minimize the waste produced by this year’s SMFA Jumbo Day, they were also able to get the future generation of Tufts students “excited about sustainability and composting at this campus” in coordination with Maria, the SMFA’s student Eco-Rep who tabled at the event. Molly and Dan with the new compost bin in the Hall of Flags at Fletcher. 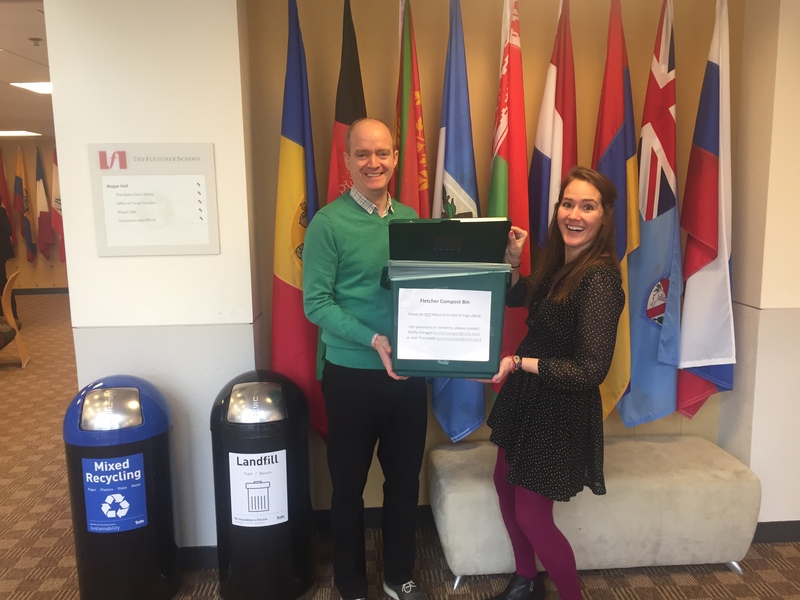 Dan Birdsall, the associate director of the Office of Admissions and Financial Aid at the Fletcher School, along with Molly Haragan, a 2nd year Master of Arts in Law and Diplomacy candidate, proposed to purchase a new compost bin for the Hall of Flags. The Hall of Flags is the Fletcher School’s highest-traffic area and main gathering location for students, staff, and faculty. 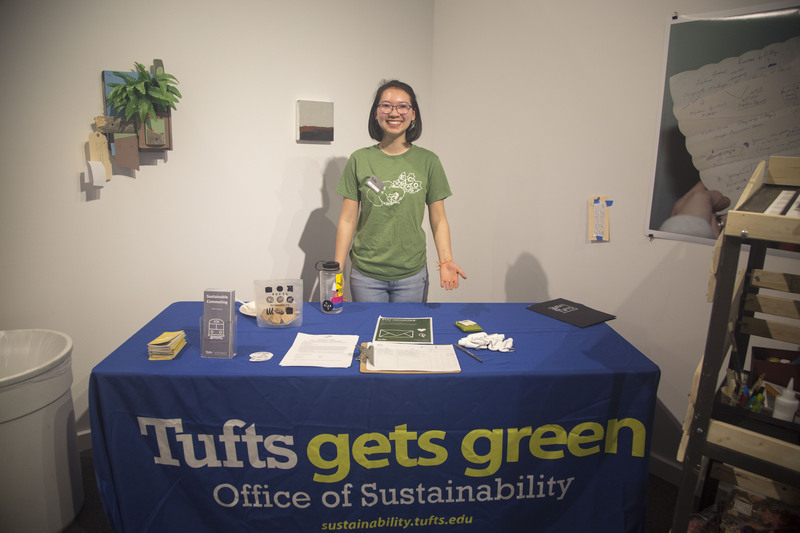 While there was already a compost bin at Fletcher in the Mugar Café, Molly noticed that a significant amount of food is also consumed in the Hall of Flags, where frequent receptions and admissions events occur. Additionally, food leftover from student-organized events are often placed in the Hall of Flags, and many students also eat in this space as well as in the rest of the building. Previously, much of the food waste from the Hall of Flags often ended up in the garbage can rather than being transported to the compost bin at the Mugar Café. As a result, an additional compost bin at this location has significantly helped reduce food waste that will go directly to landfills. “Composting is now the obvious and easy option there,” Dan explains. Molly has just graduated and identified a few returning students interested in sustainability that will help monitor and empty the bins next school year. Summer has officially begun, all of the students leaving Medford for the summer have moved out, and we can finally stop posting all over our social media about Move-Out 2018! Thank you so much to everyone who donated their unwanted items. 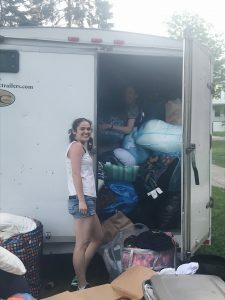 This year, we collected 14,290 pounds of textiles, 719 pounds of food, as well as a significant amount of other donations in the form of e-waste, books, appliances, furniture, and miscellaneous items! That is very significant amount of items that will not be going straight into the landfills, as would have otherwise happened. Many thanks also to all of the Recycling student workers and staff and the Office of Sustainability staff who helped sort through, organize, carry, and store all of the items. It took us many, many hours to ensure that what can be reused will have the opportunity to find a new home. So what happens with all the items that are collected? 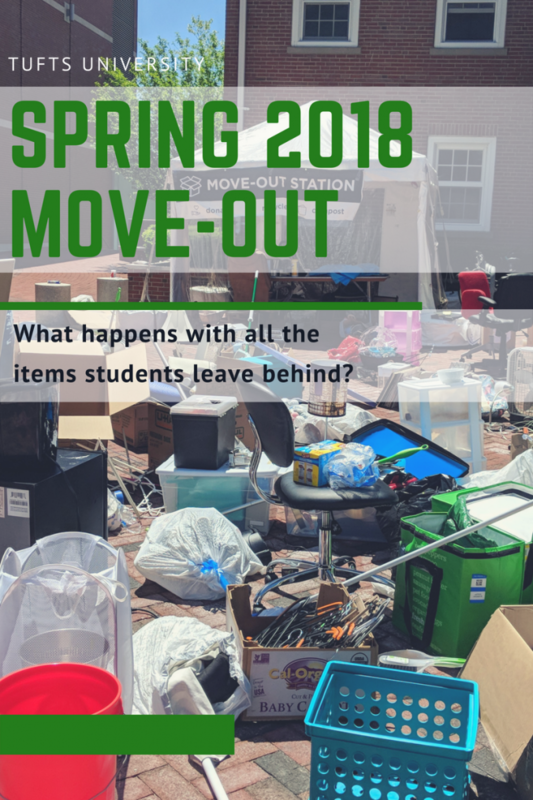 Many of the items that are in working and usable condition go to the Back To School Sale hosted by the Green House in the fall. The profits from the sale help them run programs on campus throughout the school year. 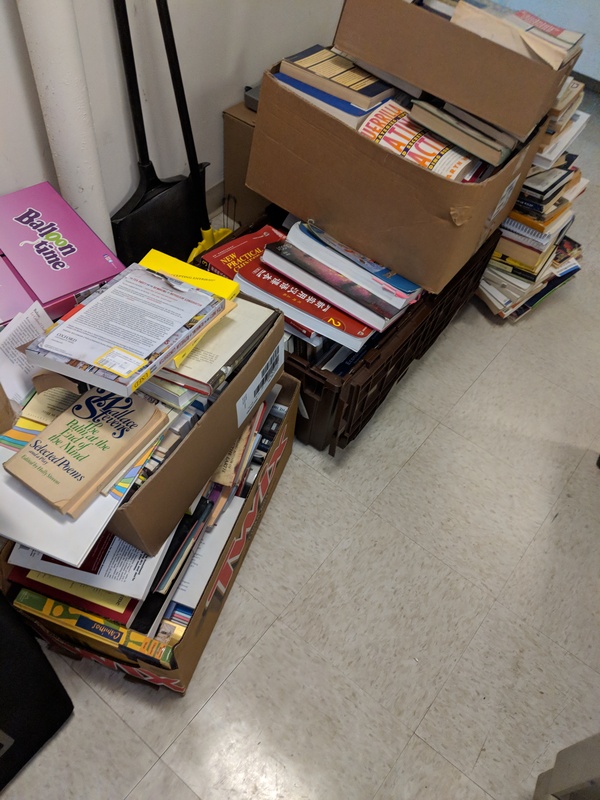 Books go to the Book-it-Forward Lending Library which allows Tufts students on financial aid to borrow textbooks and other books. 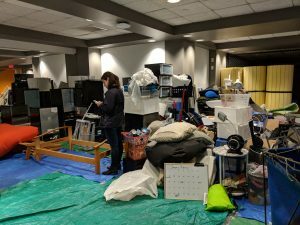 Dining hall dishes get taken back to the dining halls! Textiles (old clothing, sheets, linens, towels, etc.) go to Bay State Textiles, where 50% of the textiles are recycled for reuse, 30% are turned into wiping cloths, and 20% are recycled into new items. Plastic bags are taken to Whole Foods who then deliver them to Trex, an outdoor decking and living products company. Trex converts used plastic film into new, environmentally responsible outdoor products! Although we are happy to help minimize waste that will go to landfills through our move-out initiative, we also want to remind you that the best way to reduce waste would simply be to purchase fewer items, especially if you are not certain you will use them! You would be surprised by how many unopened packages we found of various miscellaneous items, as well as clothes and shoes that seemed barely worn. Nonetheless, everything that was donated will be put to good use, and we hope that those who will be returning to school in the fall will stop by the Green House’s Back To School Sale – there will be many great items sold at significantly discounted prices (lots of dorm furniture, some coffee makers, a pair of Hunter boots and some North Face down jackets in good condition, just to name a few)! 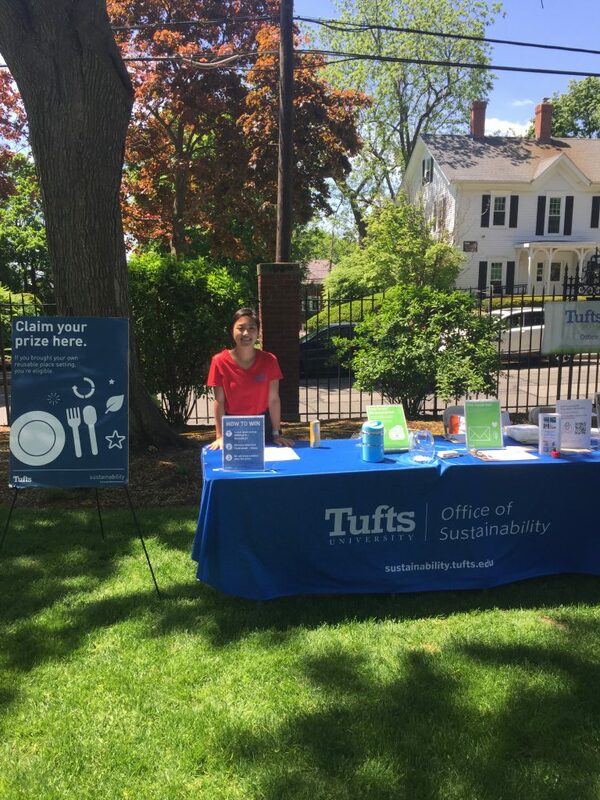 The Tufts Office of Sustainability is seeking an undergraduate intern to help update the http://operations.tufts.edu/tuftsrecycles/ website, create educational materials for waste reduction programs at Tufts, monitor the recycling & sustainability inboxes, and update various communications channels including the Sustainability at Tufts website, blog, email newsletter, and social media channels. The intern may assist with other marketing and communications tasks as needed.